Mystery shopping or Transactional surveys: Which is better? Mystery shopping has been with us for many years. And recently, a new way to measure the customer experience has become popular: transactional customer surveys. Transactional surveys, such as transactional Net Promoter Score® surveys, have only become practical in the last few years. 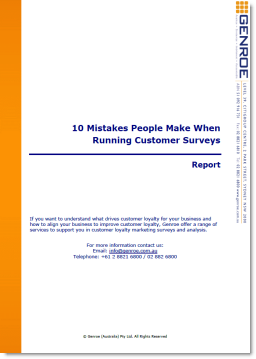 This style of survey collects customer views and perceptions via a short survey instrument just after the customer has passed through a key business touch-point. 1. Knowing when a customer accessed a touch point was difficult. Now, almost every interaction (call centre, web, email, invoicing, payment, etc) with a company is logged via some type of back end CRM system. Generating an outbound customer survey in reaction to a customer interaction is now much easier. 2. Collecting survey feedback was expensive. The widespread consumer acceptance of email/web based surveys has dramatically reduced the cost and increased the completion rate (when designed correctly) of customer feedback surveys. Gone are the days of expensive, and low completion rate, mail/paper surveys which need additional data entry costs. 3. Collating and using feedback in real-time was difficult. Having the data is all well and good but making use of it requires that you be able to analyse and interpret the data quickly. Software as a Service platforms such as CustomerGauge (disclaimer – we re-sell this product) have now made real time analysis and action easy. Now that transactional customer surveys are easy to implement does it spell the end of mystery shopping? Not necessarily, as they perform different functions. Put simply mystery shopping is about checking that a task is being done right and transactional surveys are about doing the right thing. A mystery shopper will perform a test transaction with a company and compare actually how it was performed with how it was designed to be performed. For each element of the interaction there will be a tick or cross: did they answer the call in the approved manner, did they sign off with “thank you for calling company x”, etc. This is an audit process and does not take into account whether the process is “good” from a customer perspective. On other hand a transactional customer survey gathers feedback on the customer perception of the interaction and lets you know if you are doing the right things. Working together the two approaches make sure that you know the right thing to do and that you are actually doing it. NPS is focusing on cusotmer after an experience, which is good for customers. However, what do you think about resellers/retailers? If we want to measure retailer/resellet experience, should we go for direct NPS or Mystery NPS? what do you think? If you time it right you can use NPS for the retailer/reseller experience as well. The biggest issue I have generally with Mystery shopping is that you are grading the company who has been shopped on what you care about and this is not necessarily what the customer cares about. In general I think you can almost eliminate mystery shopping in favour of transactional customer feedback.